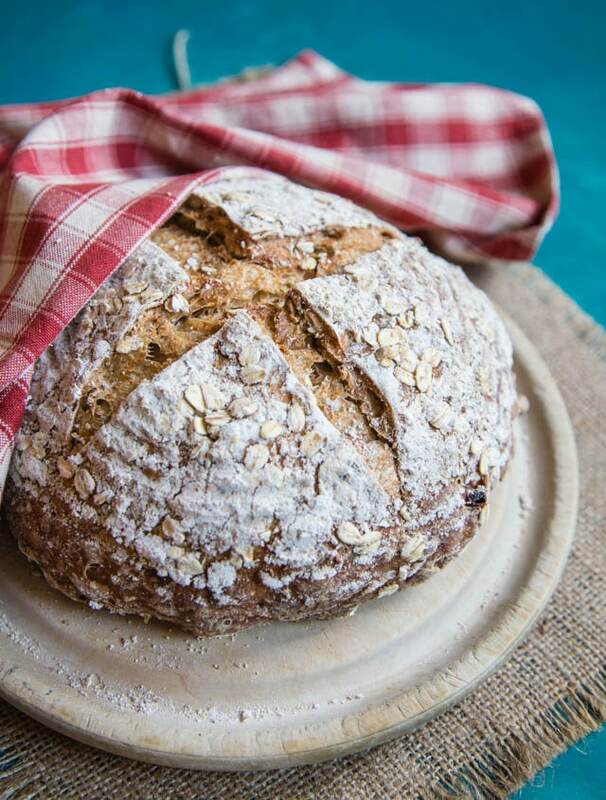 Muesli is an easy source of wholegrain and dried fruit; adding some to a bread like this sourdough gives a delicious and wholesome loaf, just waiting for some tasty jam. I’m always looking for ways to add interest to my bread. 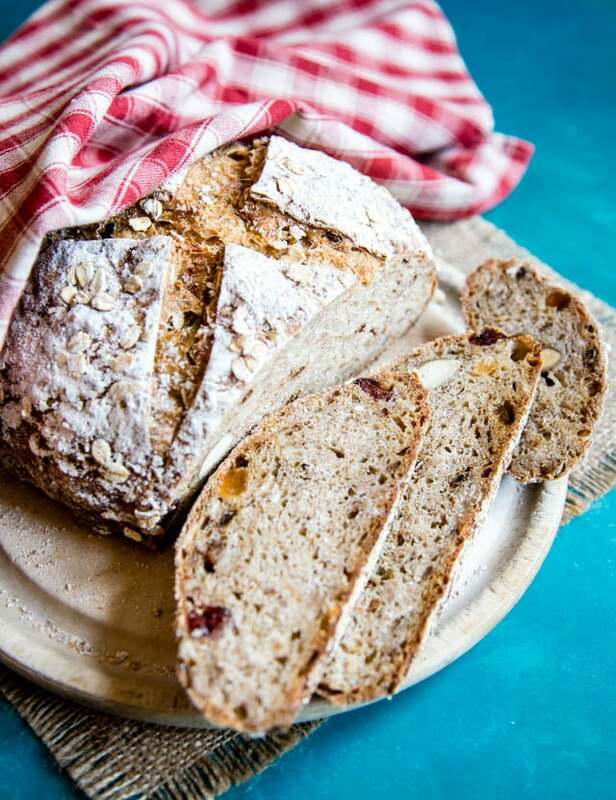 I really prefer a hearty, rustic loaf; many years ago now we were inspired by a cereal-focused blogging challenge to add some muesli to a sourdough loaf, and I’ve now revisited my recipe for muesli sourdough bread. It’s as good now as it was then, and is definitely one to make again soon. The great thing about muesli is that it’s an easy source of wholegrain flakes, nuts, seeds and dried fruit – all good stuff to add to a loaf of bread. I do check beforehand that I’m not buying a brand that includes added sugar, as that rather defeats the object for both this bread and my breakfast. For my morning bowl, I find that with most commercial mueslis, the ratio of nuts, seeds, and dried fruit etc to wholegrain flakes is too rich. I usually add some plain oat flakes to bulk it out and to reduce the amount of sugar in each portion. However, for this recipe I added the muesli straight from the packet to the dough. I used 20% of my weight of flour in muesli; I was concerned that any more would overwhelm the bread, but this ratio seems about right. Like all sourdough baking, it does take time for the dough to prove with the two raises, but this is largely a hands-off time. The actual time spent with my hands on the dough has to be only about fifteen minutes for each loaf. 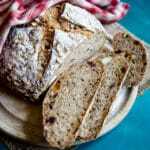 The dried fruit in particular gives the final loaf a hint of sweetness; the bread is filling and hearty, but to be fair could not be considered a feather-light and airy bread. It is a great base for one of our small batch jams, such as blackberry and apple, or one of our other preserve recipes. There’s nothing like spreading home-made jam onto home-made bread to really make you feel really pretty good about life. 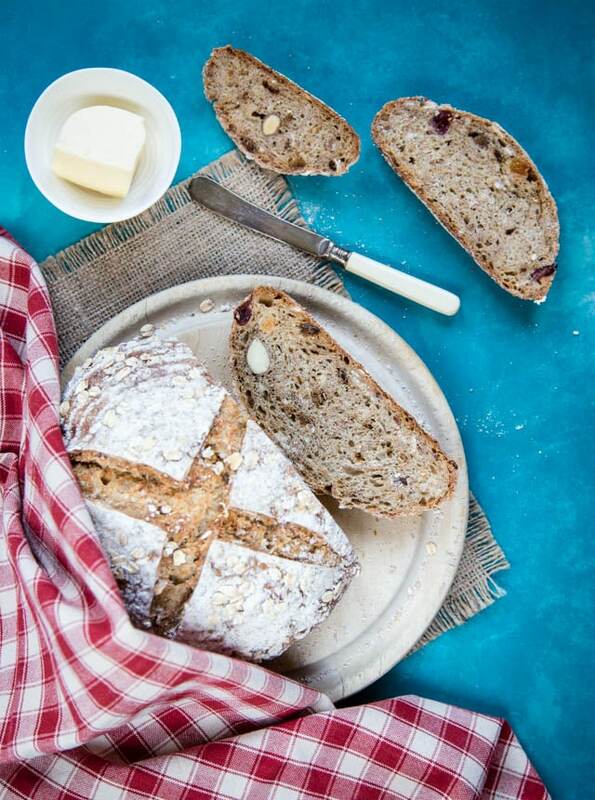 If you try this Recipe: Muesli Sourdough Loaf please tag #FussFreeFlavours on Instagram or Twitter. It is amazing for me when for me when you make one of my recipes and I really do love to see them. You can also share it on my Facebook page. Please pin this recipe to Pinterest too! Thanks for reading Fuss Free Flavours! 12 hours before you start breadmaking, refresh your sourdough starter to your preferred ratios. I use equal quantities of old starter, rye flour and water. Keep aside a few ml of the water and milk mixture, and add the salt. Whisk the ripe leaven into the remaining leaven, then add the rest of the ingredients: flour and muesli. When risen turn out onto a floured worktop, fold in the muesli (reserving a little to sprinkle the loaf with) then place in to an oiled 1lb loaf tin, sprinkle with the reserved muesli. Leave to rise again for an hour. Bake at GM6 / 200C / 400F for about 40 mins, until starting to brown. When cooked the loaf will sound hollow when tapped. Turn out and cool on a wire rack.